Lee & Low Books publishes bilingual and Spanish-language children’s books rich in culture and content. 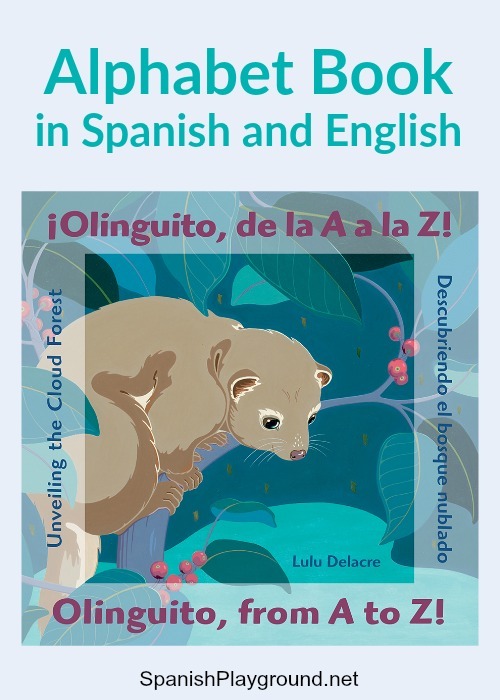 Now, new books by Lulu Delacre, ¡Olinguito, de la A a la Z! and the Rafi y Rosi books, join the collection. ¡Olinguito, de la A a la Z! is a Spanish alphabet book that introduces children to the cloud forest of Ecuador. Visit our Spanish Books for Kids Resource Page for more reviews and activities for favorite books. ¡Olinguito, de la A a la Z! is a bilingual book of discovery. The beautiful illustrations capture the mystery of the Ecuadorian cloud forest and invite children to explore and learn. 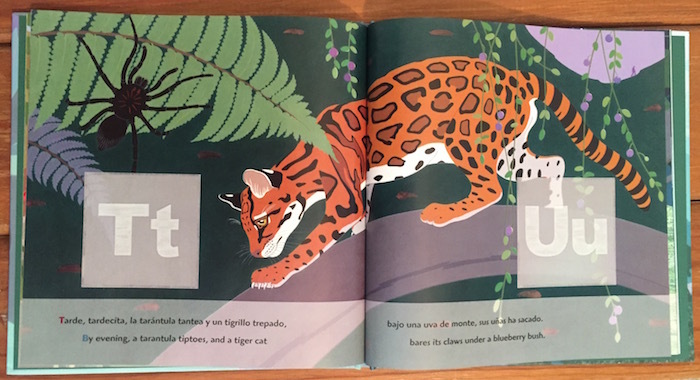 The story is framed as a Spanish alphabet book, and the alliteration makes Olinguito a wonderful read-aloud. Tarde, tardecita, la tarántula tantea y un tigrillo trepado, bajo una uva de monte, sus uñas ha sacado. The alphabet gives kids a familiar structure, but the book has plenty of higher level vocabulary. It is an excellent choice for native Spanish speakers. ¡Olinguito, de la A a la Z! is a Spanish alphabet book that grows with kids, as they discover new language and detail in the illustrations. ¡Olinguito, de la A a la Z! includes valuable content resources at the back of the book to help kids learn about the cloud forest and the scientific process. There is a glossary of the alphabet words in English and Spanish and of Más palabras útiles. In addition, with the Sé un explorador/Be an explorer picture search activities, children revisit and examine the illustrations more carefully. If you click through to Amazon and make a purchase, Spanish Playground receives a small commission. In many ways, ¡Olinguito, de la A a la Z! is not a typical Spanish alphabet book. It has rich, new vocabulary rather than representing letter sounds with early words. Like any Spanish alphabet book though, the structure is an opportunity to engage children actively with the text. ¡Olinguito, de la A a la Z! is available from Lee & Low Books and from Amazon. Trace the letter on the page with your finger. Trace it on your arm or leg or a friend’s arm or leg. Using a set of foam or plastic letters, match the letter to the letter on the page. Then put that letter into a jar. Use the alphabet to help kids predict. Talk about what letter comes next. Sing the alphabet song if necessary to learn which letter it will be. Talk about the letter sound you expect to hear on the next page. Write the alphabet on a sheet of paper and cross off a letter as you read each page. After reading the page, think of other words that start with that letter sound. Remember that you can simplify the text for beginning learners. Omitting descriptive words will allow kids to focus on key vocabulary. Once children are familiar with the story, read the complete text. Lee & Low also publishes Lulu Delacre’s books Rafi y Rosi and Rafi y Rosi ¡Carnaval! Read about these Spanish early reader books and find printable reading comprehension activities for the stories. With the Spanish alphabet book ¡Olinguito, de la A a la Z! and her early reader books, Lulu Delacre helps children take important steps toward literacy in Spanish. Her books are an excellent choice to develop bilingual, bicultural readers. Disclosure: The company sent me a copy of this product to write the article. All of the ideas and opinions are my own.